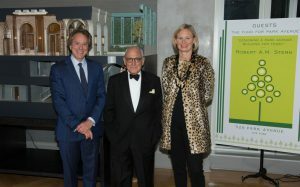 Shown (from left) are: William Lie Zeckendorf, Robert A.M. Stern, and Barbara McLaughlin, president of The Fund for Park Ave.
Manhattan, NY 520 Park Ave., Zeckendorf Development’s new residential tower hosted a reception on November 15th for The Fund for Park Avenue together with First Republic Bank. The private cocktail reception at the 520 Park Ave. sales gallery celebrated The Fund along with the 2016 Park Ave. Tree Lighting and featured remarks by Robert A.M. Stern. Robert A.M. Stern, founder and senior partner of the firm that is designing 520 Park Ave., discussed the topic of “Designing a Park Avenue Building for Today” at the event, which also offered a sneak peek into the life in the Ave.’s newest luxury building. The tradition of lighting the trees along Park Ave. each winter began in 1945 to honor the men and women who died in WWII. Today, the illuminated trees serve as a memorial to all who have lost their lives defending our country. The Park Avenue Tree Lighting is made possible by the contributions The Fund for Park Avenue receives from the community. The 2016 Park Avenue Trees will be lit on the evening on Sunday, December 4, 2016 following a ceremony outside the Brick Presbyterian Church. Located at East 60th St. between Park and Madison Ave., 520 Park Ave. will become one of the tallest buildings on the Upper East Side. A tower with exclusively 33 residences. The 54-story, 800 ft. tall tower will feature full-floor residences designed by Robert A.M. Stern Architects. In the tradition established by 15 Central Park West, 520 Park Ave.will be entirely clad in Indiana limestone, articulated with hand-set stone detailing reminiscent of the great historic 20th-century apartment houses but at heights that are truly a modern 21st-century expression. 520 Park Ave. is being developed by Zeckendorf Development, with Park Sixty LLC and Global Holdings. Construction is expected to be completed in early 2018.